Brussels Sprouts; the green leafy vegetable that is loved or hated. There is no inbetween with brussels sprouts and can be an acquired taste. 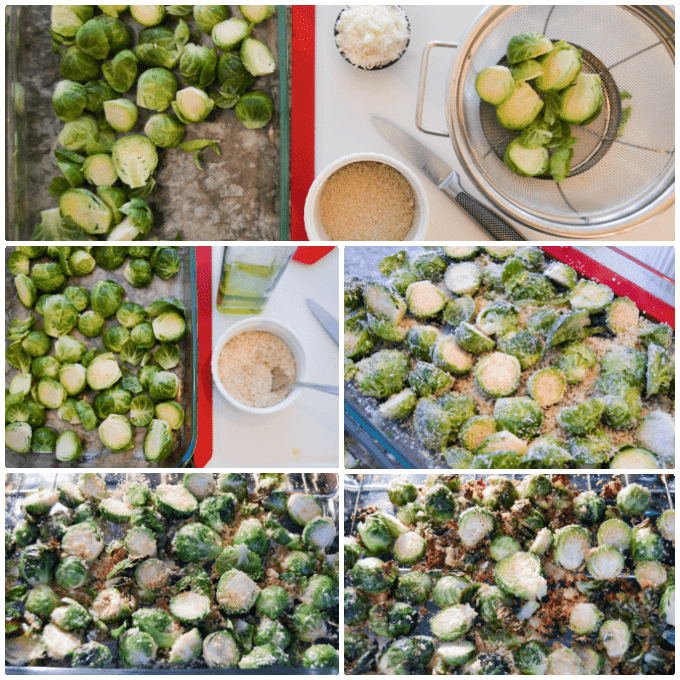 If you love brussels sprouts, this is the recipe for you! If you do not like brussels sprouts this recipe might change your mind. This parmesan crusted roasted brussels sprouts recipe has become an instant favorite in our house. Roasting is my favorite way to cook brussels sprouts. I love roasted brussel sprouts with crispy browned leaves, yet still green in the middle. To me it’s the ultimate way to cook and enjoy brussels sprouts. If you don’t like brussels sprouts it could be that someone boiled the heck out of them when you were young and the texture and flavor just didn’t sit well with you. These parmesan crusted brussels sprouts are great roasted in a conventional or convection oven. That’s why I share directions for roasting them both ways below. I highly recommend using a glass or corningware baking dish though. Roasting brussels sprouts this way spares the crispy leaves and crust that would get stuck on a sheet pan. We inherited a convection oven in our new home so I have enjoyed using it to get crispier food. The convection oven’s circulating heat makes for greater browning and crisping so it’s superb for this brussels sprouts recipe. Roast up a batch of these paremesan crusted brussels sprouts and let me know what you think in the comments below. This is a great easy weeknight side dish or hot holiday side! I use a 9 X 13 glass baking dish because it's the least mess to clean up, plus roasts the brussels sprouts real nice without sticking to sheet pan. These reheat better than most brussels sprouts I've made also. Add your halved and cleaned brussels sprouts to a 9 x 13 glass or corningware baking dish, add oil and stir to evenly coat. Do not overfill your dish. You want a single layer of brussels sprouts. If you want to double your recipe use a 2nd baking dish to not overcrowd. Roast brussels sprouts for 20 minutes, stirring midway through. This will get your brussels sprouts roasted, browned and crispy on the outside, yet still a little green and al dente. If you prefer them more roasted add 5 minutes for conventional roasting and 2-3 for convection, watch closely for burning though.